Mr. David Clay Sidebottom of the Gabe Community of Green County, son of the late Loy Sidebottom and Maudie Jones Sidebottom, was born on Saturday, April 8, 1939 in Green County and departed this life on Sunday, September 16, 2018 at his home. He was 79 years, five months and eight days of age. He had a made a profession of faith in Christ and was a member of the Summersville Baptist Church. Mr. Sidebottom loved his Lord, his family, was a lifelong farmer and was a Kentucky Colonel. Survived by his wife: Sylvia Scott Sidebottom of the Gabe Community having united in marriage on August 8, 2008.
a brother and two sisters-in-law: Jim and Ona Sidebottom of Summersville, and Erna Wheat Sidebottom of Greensburg; the mother of his children: Patty Joan Sidebottom of Campbellsville; and a host of nieces, nephews, other relatives and friends. Mr. Sidebottom was also preceded in death by two sisters and brothers-in-law: Duval and Philip Hay, and Betsy and Dale Shuffett; three brothers: Harold Sidebottom, Darwin J. Sidebottom and Loy Jones Sidebottom. 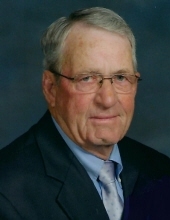 The funeral services for Mr. David Clay Sidebottom will be conducted at 11:00 A.M., Central Time, Wednesday, September 19, 2018 at the Cowherd and Parrott Funeral Home with burial to follow in the Sidebottom Cemetery. Bro. Mike Akridge and Bro. Daniel Marcum officiating. The family has asked that expressions of sympathy take the form of donations to the M.D.S. Foundation or the Gideon Bible Fund, which can be made at the funeral home. To plant a tree in memory of David Clay Sidebottom, please visit our Tribute Store. "Email Address" would like to share the life celebration of David Clay Sidebottom. Click on the "link" to go to share a favorite memory or leave a condolence message for the family.